OK… First I’ll access the secret military spy satellite that is in geosynchronous orbit over the midwest. Then I’ll ID the limo by the vanity plate “MR. BIGGG” and get his approximate position. Then I’ll reposition the transmission dish on the remote truck to 17.32 degrees east, hit WESTAR 4 over the Atlantic, bounce the signal back into the aerosphere up to COMSAT 6, beam it back to SATCOM 2 transmitter number 137 and down on the dish on the back of Mr. Big’s limo… It’s almost too easy. It’s hard to overstate the achievement that SpaceX made on Wednesday with the successful flight of its Dragon spacecraft. Launching the spacecraft into orbit, while hardly unprecedented, is no simple feat: national space agencies in places like Brazil and South Korea have failed to accomplish this. Maneuvering a spacecraft in orbit is also nothing new, but not anything to be taken for granted on a spacecraft’s first flight. Deorbiting that spacecraft, though, having it safely reenter the atmosphere, then splash down virtually right on target in such a manner that, had anyone been on board, they would have had a “nice ride”, in the words of Elon Musk, is an impressive accomplishment, especially on a first try and with virtually everything working as planned. Despite all the complexities, it looked “almost too easy”. The launch is obviously a major milestone for SpaceX, clearing the way for future Dragon flights to service the ISS, as well as create momentum for its plans to develop crew transportation systems. It’s also a major accomplishment—or a source of relief—for NASA, which was putting so much emphasis on commercial providers for supporting the ISS. It will also likely buoy other commercial space providers, demonstrating that you don’t have to be a government agency to do things like launch and recover spacecraft. And it may, at least for the time being, quiet critics of commercial space and NASA’s new emphasis on it. One thing that should be kept in mind during all these congratulations and celebrations: while it may look easy, it is not. It’s quite possible there will be future setbacks—launch delays, failures, other malfunctions—for SpaceX or other companies entering this field in the months and years to come. Celebrate yesterday’s achievement, but keep in mind it’s just one step of many more to come. While SpaceX has much to be proud about, lets not forget NASA was overlooking this whole process. With NASAs help I could probably put a space vehicle into Earth Orbit too. Remember SpaceX is standing on the shoulders of those who have come before. A two orbit hop, today is miniscule when compared to Moon flights carried out by NASA. Let us hope that this little jaunt does not alter our governments plans with regards to Orion! I’ve seen a lot of comments around the internet over the past day or two from people who twist and misrepresent the facts about this event. The commenters obviously know the facts, so they are probably in the aerospace industry, but they distort and lie about SpaceX so blatantly that it seems they must be engineers who work for the competing companies, Lockheed and Boeing. These competing comanies have sucked up many times the amount of government money that has been paid to SpaceX, but have produced nothing, because of their decades long cozy relationship with NASA. The “cost-plus” contracts that these companies have with NASA have allowed them to be paid for all the costs they claim to incur without producing any flying hardware. With the arrival of independent and vastly successful entrepreneurs like Musk and Bigelow, who have gotten impatient with watching our future ebb away their whole lives, we see a blizzard of propaganda. These engineers do have families to feed, but when they look in the mirror in the morning, they should acknowledge that they are in fact betraying their children every time they drive to work. Please, give it a shot. SpaceX spends less than 1/10 what Orion has cost us halfway into its development, orbits its spacecraft years sooner, and you’re pining for Orion? How obtuse can you possibly be? You’re a pathetic excuse for a space advocate, a corrupt status quo supporter. SpaceX did all the work, NASA did at best nothing and at worst made it harder for them. You should be ashamed for lying about this brilliant accomplishment by Musk and his team. 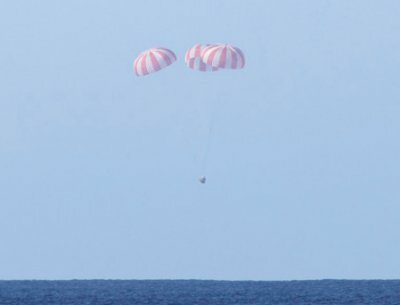 In fairness to Dennis (well somewhat, he was being a bit of a troll there too), SpaceX did have the experience of not just NASA, but also the Russian space program in terms of how to put capsules up into orbit and safely return them back to the ground… and more importantly find out what kinds of problems can happen to screw that up. I’d like to add China to that mix, but China has been so secretive and copying all of the Russian procedures for the Soyuz that they aren’t providing anything new. All of that experience has been useful, but at the same time the knowledge represented by that experience is open and available to almost anybody who is interested in going up into space too. The NASA bureaucrats at the design reviews for the Dragon & Falcon 9 certainly weren’t there to pass on knowledge of previous accidents and mishaps in a meaningful way. While SpaceX made a few rookie mistakes with the Falcon 1 launches, they have also shown that they do learn from those mistakes and are making significant strides in the development of their vehicles. If anything, it is too bad that there wasn’t a major problem that showed up, as that would have implied an area to learn from in terms of an engineering flaw that was missed. You tend to learn more from your mistakes than from having everything work correctly, but then again it shows that the SpaceX engineers have certainly been doing their homework trying not to repeat the mistakes from the past. The impressive thing is how Elon Musk has taken a hard review of the costs for access to space and streamlined the part manufacturing and procurement process down to an art. That isn’t a trivial accomplishment by itself, and I look at the amazing thing being the company that is SpaceX and its manufacturing processes as something worthy of emulation. Because of how the Falcon 9 has been put together, it is both cheaper to build and much more reliable than many other rockets that have been built before of that same size and capability. The Falcon 9 as the end-product of that manufacturing process is really amazing, especially as that company now starts to chew through its backlog on its customer manifest. I’m in no way diminishing the success of SpaceX, but it bothers me some to see all of the comparisons between Dragon and Orion. Dragon is a test article, designed from the outset to deliver cargo/personnel to ISS. Orion, differing, has the burden to not only be capable of the ISS resupply mission , but that of being a Beyond-Earth-Orbit spacecraft. Remember, Orion was also intended to make Lunar missions as well as asteroid rendezvous. Apples and oranges. Do we need Orion? At all? For ISS resupply and other LEO applications, Orion is overkill. I think you’re in agreement on this point. And in my opinion, Orion isn’t well suited to long-duration missions. It’s just too small. We need something similar to an ISS or Salyut module or to the Bigelow designs for missions that last longer than a few days. Can you imagine sitting in Orion for nine freaking months to get to an asteroid or to Mars? Then doing it again to get home? Not me. People need exercise to stay healthy in zero-gee, and they appreciate a bit of privacy and a place to put their stuff. Even hot-bunking submarine sailors get a kit bag and corridors to walk through and an occasional shower. That leaves lunar missions, or Lagrange-point missions, for which Orion would be a good fit. But how much would it cost to upgrade Dragon or the Boeing capsule to this capability, compared to the cost of Orion? I can’t imagine that Orion would be a good bargain by comparison. Lastly, there’s no funding yet for long-duration missions. It makes no sense to blow money on Orion today when it may take decades to launch a mission that would use it. Let’s be smart about this and only spend money on stuff we need today, with an eye to future capability where practical. Let’s part out Orion and get as much value as possible from the money we’ve already spent on it, and not spend any more on it unless and until it’s determined that Orion is the best choice for an existing funded mission. Disclaimer: the above is only my opinion, and I’m nobody in particular. The latest information from Elon Musk, is that the heat shield of the Dragon came through so well, that upgrading the Dragon capsule to be able to do Lunar missions is possible. I don’t want to get carried away, but the Dragon design looks very modular. It looks as if subsystem upgrades for different missions will be relatively inexpensive.